Procrastination they say is the thief of time, but on Black Friday and Cyber Monday, it is the thief of customers, sales, and revenue, especially for e-commerce businesses. With barely a few days to go, you probably have already prepared your online store for the Black Friday and Cyber Monday shopping rush, which will bring in more sales and revenue. But are you sure everything is in the right place? Remember how accidents occur during rush hours? People and cars get cluttered, and everything that moves becomes stagnant. The BFCM period is no different. During such a period where online retailers are busy searching for ways to cash-in on the season’s sales, preparations are always rushed and a lot of things are forgotten. But as you know, we’ve prepared for the 2018 BFCM week with your online store in mind. 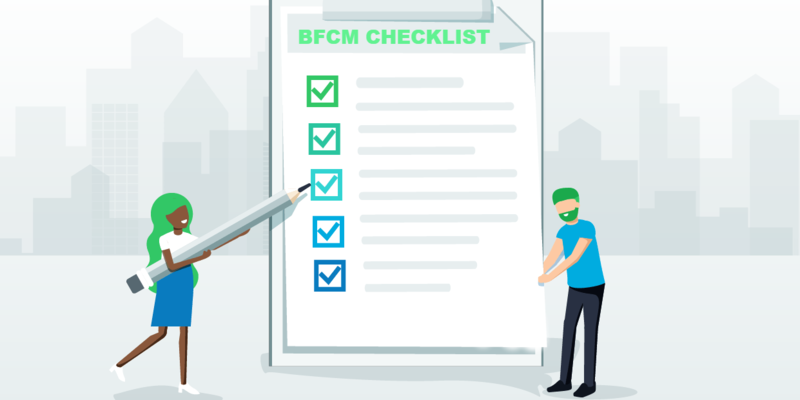 Take up your pen and paper and let’s check the boxes to see which of the 15 BFCM to-do list you’ve implemented in your store already and which ones you are yet to implement. Let’s get the ball rolling. Have you final-tested your site’s design? How ready is your site for BFCM? This is the time to conduct the final testing to make sure everything works fine. But what do you test? Your landing pages, hero images, banners, your hosting plan, and any other thing that might lead to delays in displaying a product or hindering a customer’s checkout process. Have you cleaned your cache? Just like clogged gutters, a large Cache size is bad for your website’s speed. Clean your cache to increase the speed of your site and reduce the customer’s frustration of having to wait for a product or page to load. People take to Facebook and Instagram during BFCM just to brag about the cheapest deals they’ve hit. This is the time to finally test-drive your social media marketing strategy, including your Facebook and Instagram ads, and increase your engagement. Twitter turns any word or group of words preceded by the Hashtag into a searchable link. Also, Instagram posts that use at least one Hashtag get 12.6% more engagement than posts that exclude them. During BFCM, it is your responsibility to scourge the internet for every relevant Hashtag in your niche and leverage it for more engagement and sales on Twitter and Instagram especially. No matter the size of your shop, there will always be customers who are dear to your shop because of their loyalty. Don’t forget to send them last-minute, enticing email marketing campaigns about your deals and how they can enjoy the season’s shopping spree. Will you allow new customers to come into your store, buy products, and leave just like that? What if you can turn these random visitors into long-term customers even after BFCM? Use this opportunity to prepare for these customers by offering rewards and coupons in return for their emails. Remember you are building your store beyond the holiday season. Review your stock for the last time. Stock outages can collapse your online store in no time. Always double-check all the goods you have online and make sure they are available in physical stock. Reach out to your suppliers if any and make sure they are ready to replenish your stock in times of peaked demands. Are your discount and promotional codes working well? You will offer discounts on the BFCM right? And have you made sure that all the discount codes are working? Get yourself a small spreadsheet of all the codes and test them in incognito to ensure they work before we hit the D-day. Also, ensure that your rewards program is prepared to handle all issues that might crop up as customers redeem their points. Is your FAQ up to date? I guess you already have an FAQ. With Black Friday and Cyber Monday already here, your old FAQ needs to be updated so you can better serve new customers who have never visited your store but will do so in the shopping season. Leverage Micro Influencers for more sales. Micro Influencers have highly dedicated niche followers. To kill BFCM, you need to reach out to Micro Influencers in your niche, especially on Instagram, and use them for more sales. You are not going to DM a Micro Influencer and they will just reply you at once. You need to provide them with something interesting, it could be a free product, free shipping, or a discount on your store, and ask them to mention your products. A single Micro Influencer might be a goldmine for your store on BFCM. Is your internet working fine? There are many things that are constant in this world – the future, taxes, day and night, and the internet is not part of them. Your WiFi or Internet Provider could develop scary tantrums anytime, even during the peaked periods of BFCM. If you want to fulfill your customers’ orders without trouble, this is the time to have a backup plan, including a WiFi and about 2 providers on standby just in case. Nobody is saying your customers will return the goods they buy from your store during BFCM. But customers who make purchases during such rush periods always make impulsive decisions, and you never know, some customers might regret and decide to go back on their purchasing decisions. This is 2018. You don’t have to suffer going back and forth, updating products on your site, sending emails, and sharing on social when you can automate all such tasks. In such a busy shopping time, it is imperative to automate, especially your social media shares. The Lotus App is an excellent tool that will automatically post your new product updates on social media channels, giving you more time to focus on making more sales. Credit card hijackers are everywhere on the internet. Make sure you have a strong online firewall provider for your store. This will not just protect your financial information but will help your customers shop securely. Make sure you have a good campaign and sales analytics system in place to measure your campaigns, sales, and visitor statistics for the season. It’s good for future decision making. It’s increasingly becoming difficult for e-commerce businesses to keep their profitability in the long run and you shouldn’t be one of them. Use these checklists to close more deals during BFCM and gain more customers even after the shopping season has ended.